Genevieve von Petzinger is a PhD student under the supervision of April Nowell in the department of Anthropology. Her main area of interest is European Upper Paleolithic (Ice Age) rock art, in particular the geometric imagery, and how this practice could be used to identify cognitive and symbolic evolution in modern humans. Genevieve is also interested in the the development of early graphic communication and in the potential of the abstract markings to track patterns of migration and cultural borrowing during this early chapter in human history. 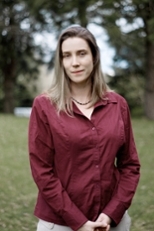 Her work was featured in New Scientist in 2010 and again in 2013 and her research will be the subject of a story on CBC's The National and Les Annees Lumiere in 2014. She has also appeared on the Discovery Channel's Daily Planet show and in 2013 was named a TED Senior Fellow. Genevieve's current project involves documenting the geometric signs at understudied rock art sites in France, Spain and Portugal. Follow Genevieve's research on her facebook page.